Let's get back to a Flashback Friday's shall we, at least for one week. 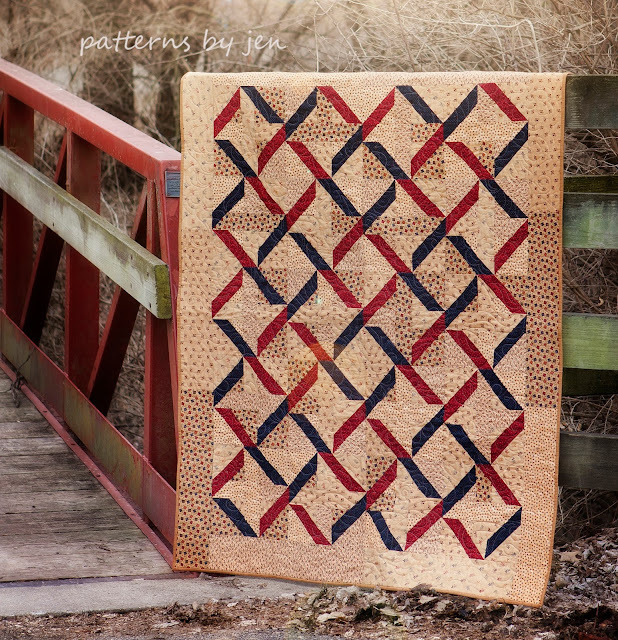 Linked is the 3rd pattern in the PBJ family. Linked came from just a doodle. A little drawing in my notebook of graph paper. 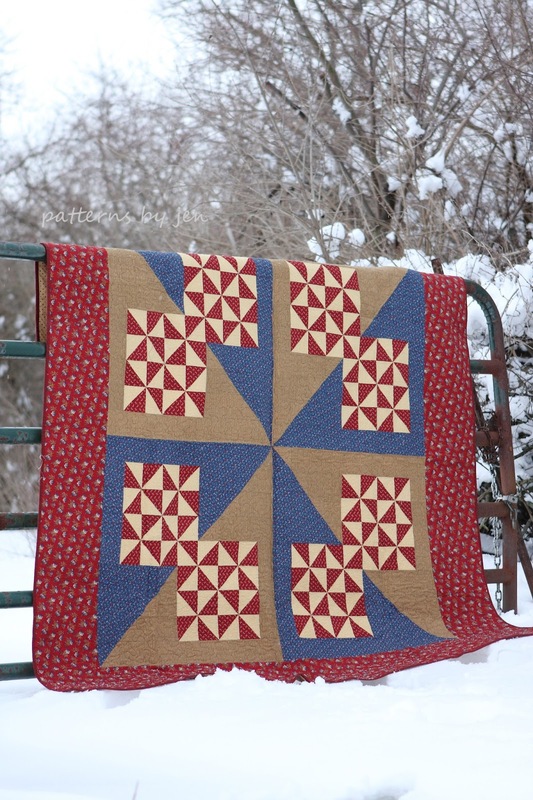 I was still working on Cartwheels on the Prairie, which was supposed to be the 3rd pattern. However, once this one found it's way onto the paper it called to be done next. Look how beautiful in the Kansas Troubles line it is. I was much more comfortable making this version, scrappy doesn't come naturally for me, so this one was made first. 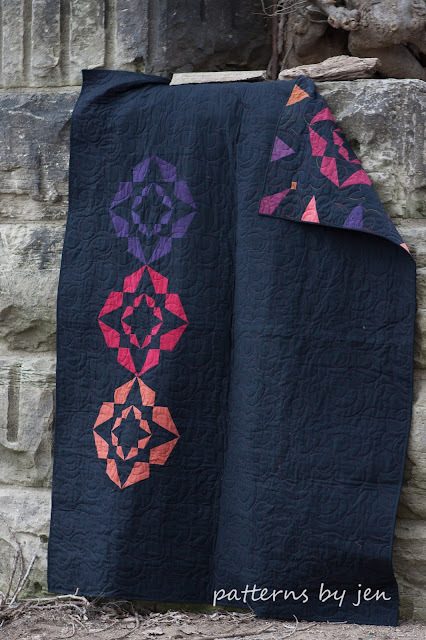 I do love how black sets off a pattern. 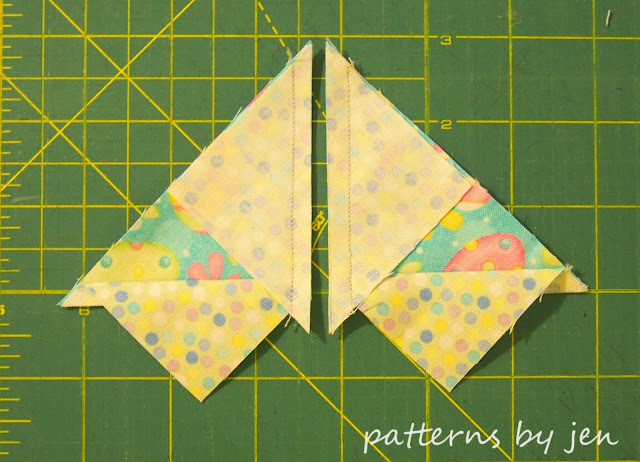 Let's take a look at a couple of mock ups using new fabrics. 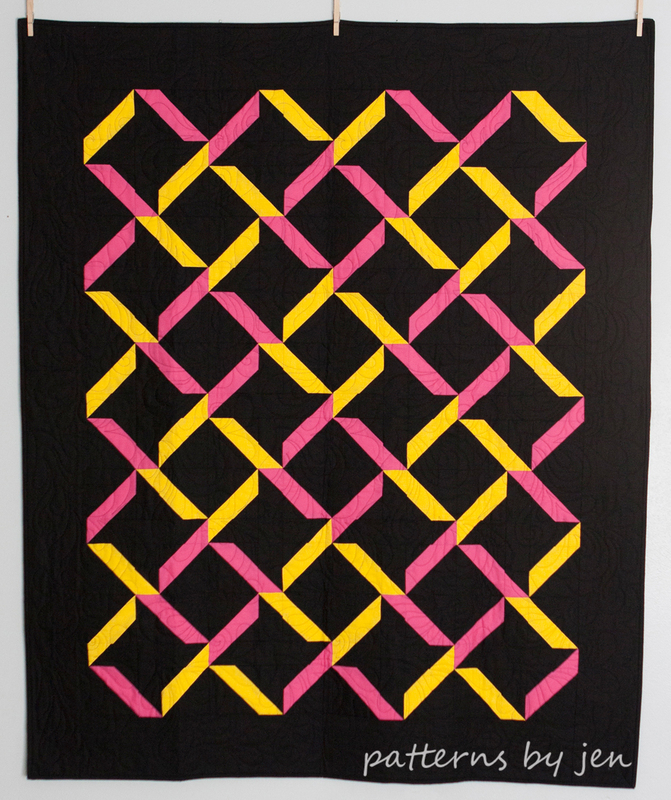 There is something about a quilt with just two colors. It's simple, yet beautiful. Love those retro tv's from the Bee Basics line by Lori Holt for Riley Blake Designs. 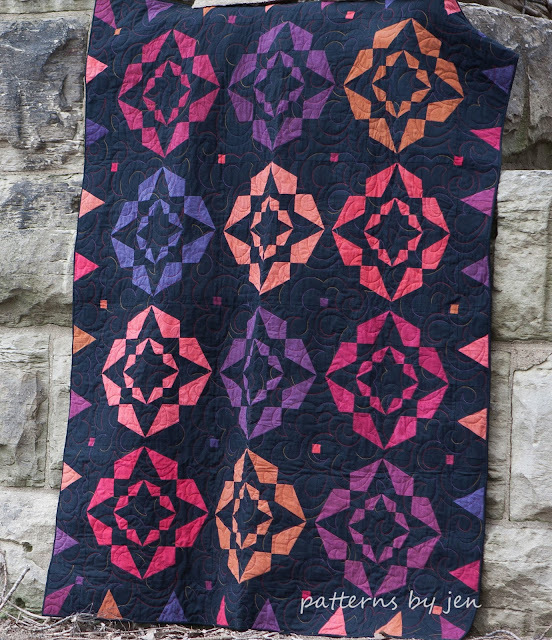 Obviously I am stuck on this quilt in two colors. I may need to remake it! I am also dreaming of spring, because apparently Mother Nature thinks we Minnesotan's can live in cold forever. So greens it is. 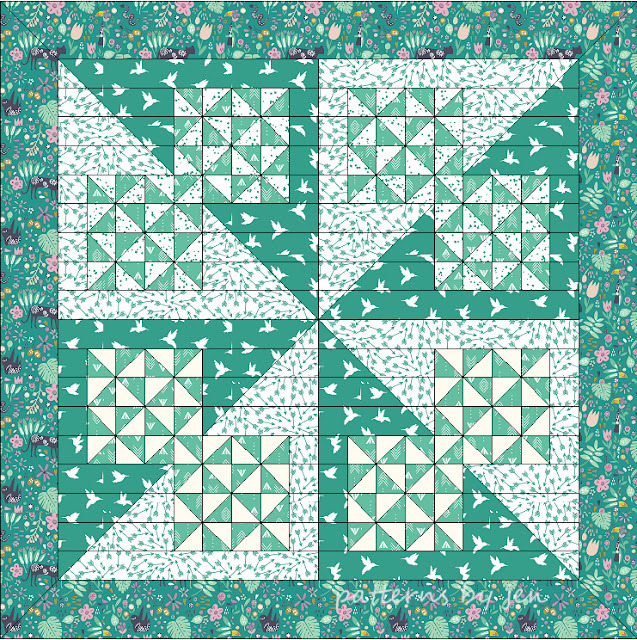 This beautiful green is not the only bright fun color in the Carousel line from P&B Textiles. 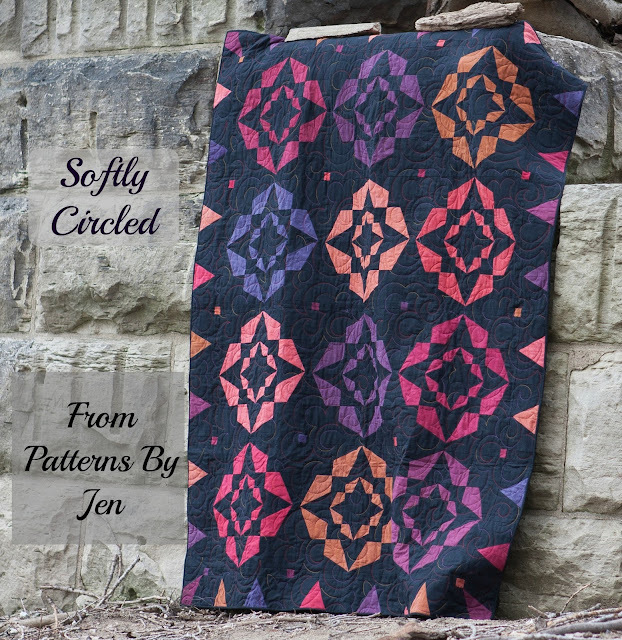 Find Linked on Etsy and Craftsy, and don't forget you can still get Softly Circled on sale through today (April 28th). Have you ever sat down to write a post and have it just snowball on you? The post that should have happened today has exploded into, what I think will be a fabulous series. However, that means that there is a big blank this week for blog posts. So lets do a This and That Thursday sort of post, shall we? If you are at the Puducah Quilt Show don't forget to stop by Cherrywood Hand-dyed Fabrics' booth. They have the lap sized version of Softly Circled kitted and ready for you to take home! If not for the quilt pattern, do it for the fabric. You will not be disappointed!! 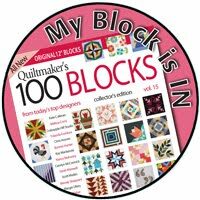 If you haven't heard, Quiltmaker,s 100 Blocks is available May 2nd. 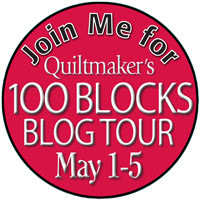 There is a huge blog tour planned and it starts next week! 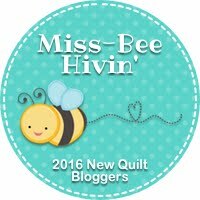 My day is Friday, but make sure you check out each blog throughout the entire week. Did you catch that? 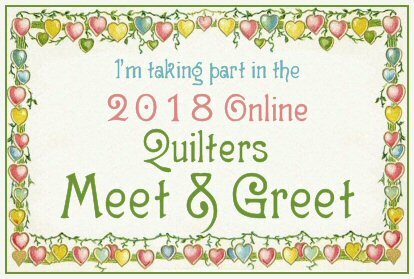 I am part of the blog hop, Why? I have my first block in the magazine! Whoop whoop! 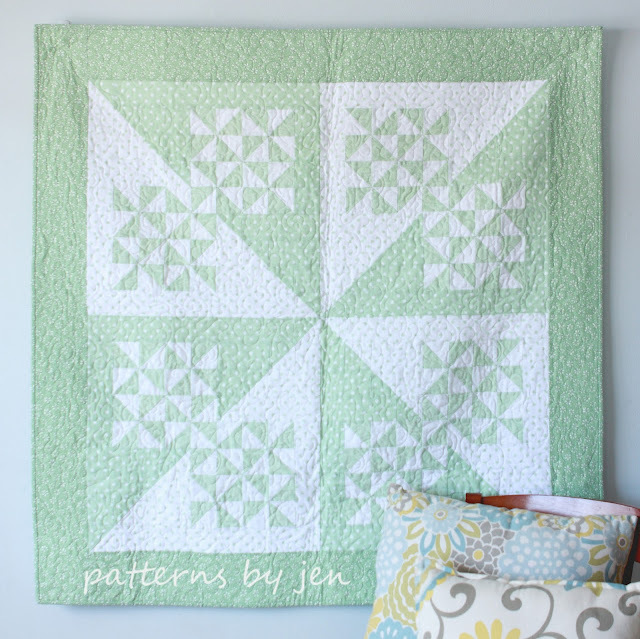 Get ready for a great week, with lots of giveaways from the designers and fun blog posts. With a theme of "Block Tour Road Rally" how can it not be loads of fun? Thanks for joining me for a This and That Thursday! Here she is! Pattern 10 in the PBJ family: Softly Circled! Let's just enjoy her beauty for a moment, and the fact that my 15 year old daughter requested to keep this one. Did you hear that? Angels started singing. It's bright, it's beautiful and it's hers. Look at this gorgeous sample. 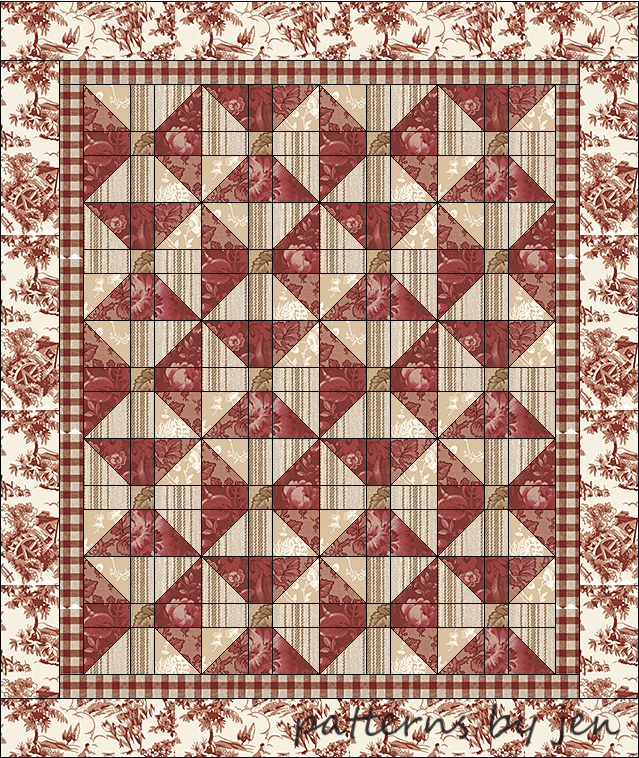 I made this one using the Renaissance fat quarter pack from Cherrywood Hand Dyed Fabrics. If you have never heard of them, you are missing out. 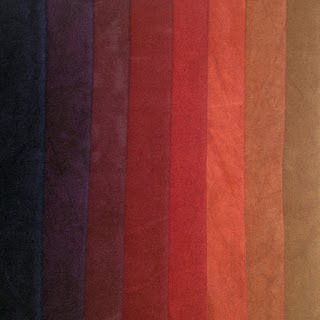 This fabric looks like suede but is 100% cotton and just butter to work with. Guess who is sponsoring the giveaway??!! YES! 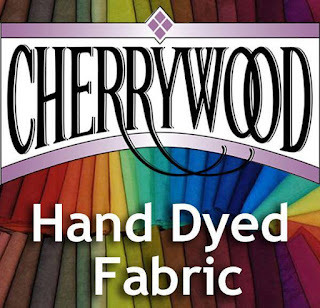 Cherrywood Fabrics has generously given an 8-steps bundle of fat quarters of their gorgeous Renaissance fabric. Oh. My. Beautiful. The colors are just rich. 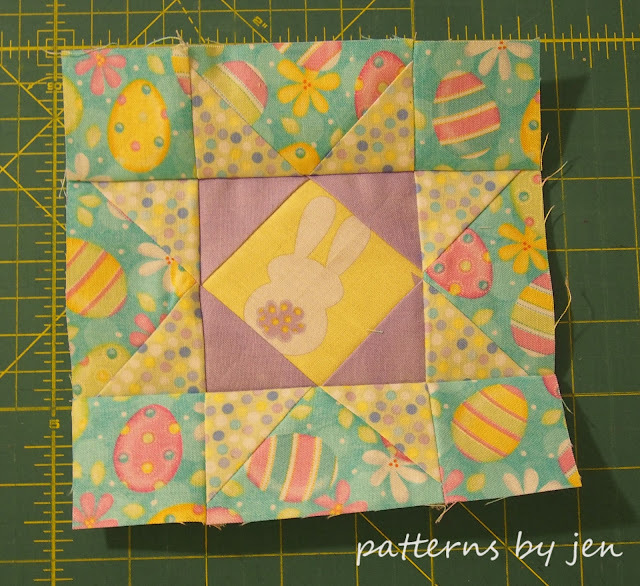 Lets take a look at a couple of testers quilts and then we'll get back to the giveaway. Here is Sandy's version. I love that she used two colors, but used different values of blue. 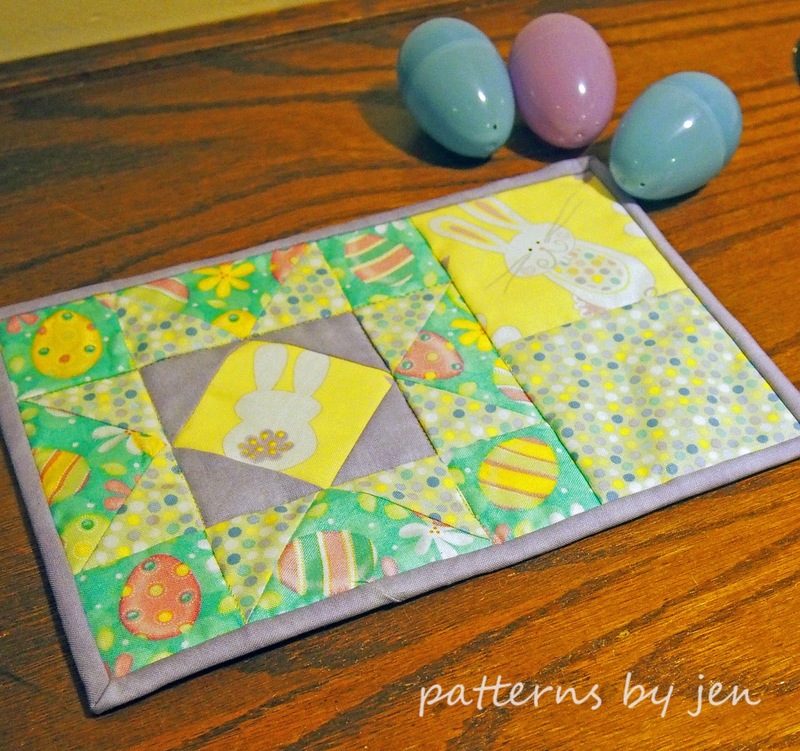 Sharon chose to do just two colors as well, this time keeping the circles all one color. Isn't it funny how the same pattern takes on a life of it's own with each quilter? This pattern requires the Corner Beam® ruler from Deb Tucker's Studio 180 Design. 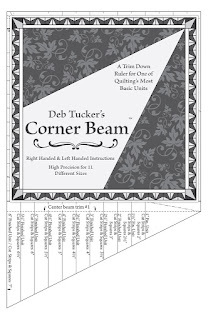 Templates are included if you prefer, but the ruler is so easy to use and speeds up the process. No affiliation here, I'm just a fan of good rulers, not so much of templates. 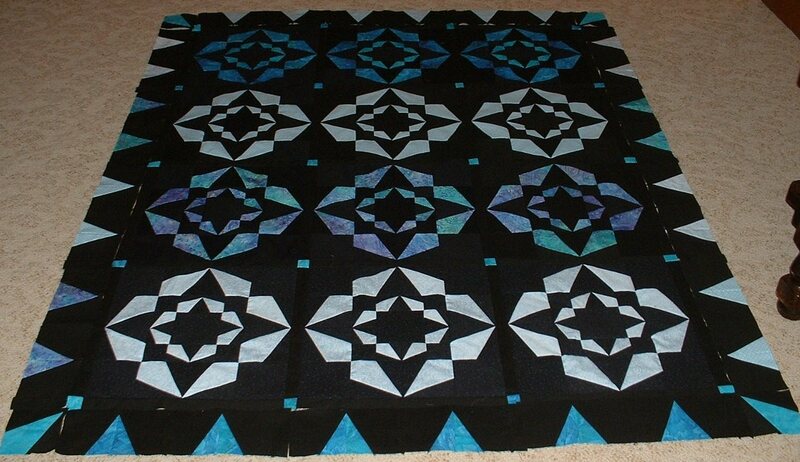 For the lap size quilt I used 2 packs of the 8-line Renaissance. 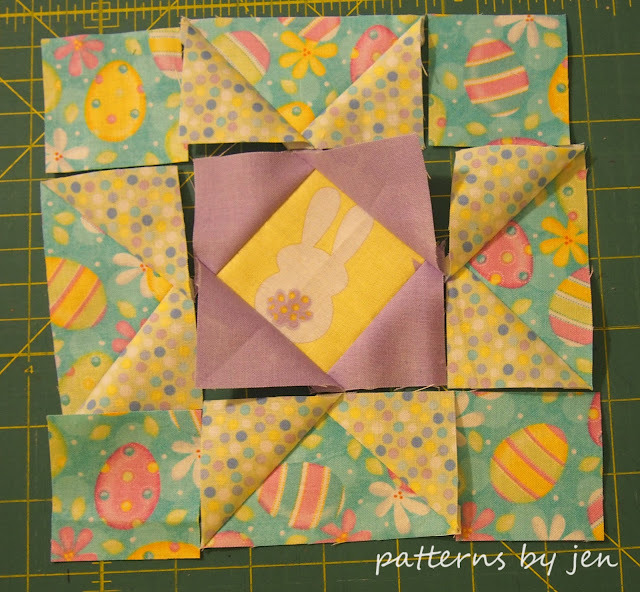 I had 3 extra fat quarters and decided to make 3 more circles for the back. I think I love it as much as the front! Lets talk giveaway!! The giveaway runs through Monday, with a winner being announced Tuesday. You will be contacted through email, and I will send out your 8-line Renaissance fabric. Good luck! Through April 28th only the introductory price is $5.00! 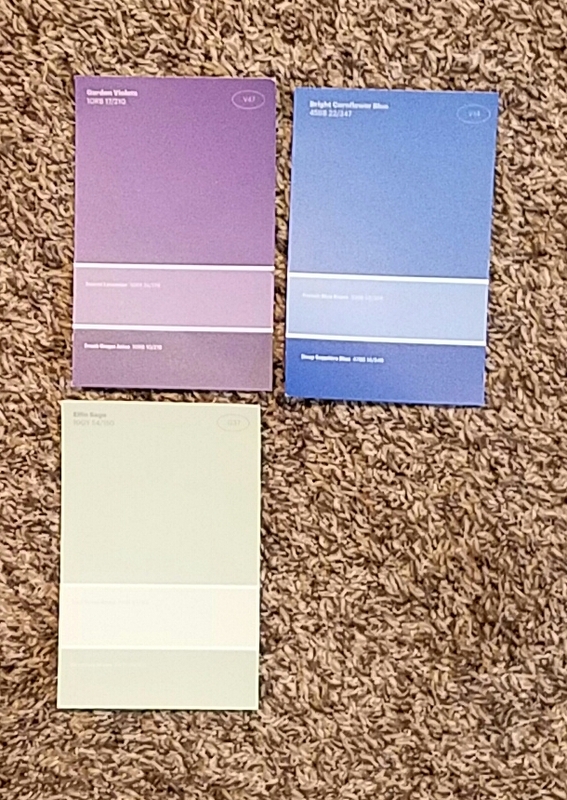 There are so many places to find help in choosing colors. Last week I went over how I get help choosing my colors. This week I am going to give you other links for understanding color and pulling colors. The Art of Choosing Color from In Color Order is an entire series that delves into colors and fabrics. Confession: I have just found this one, and I have had a chance to get through all of it, but I am totally hooked. 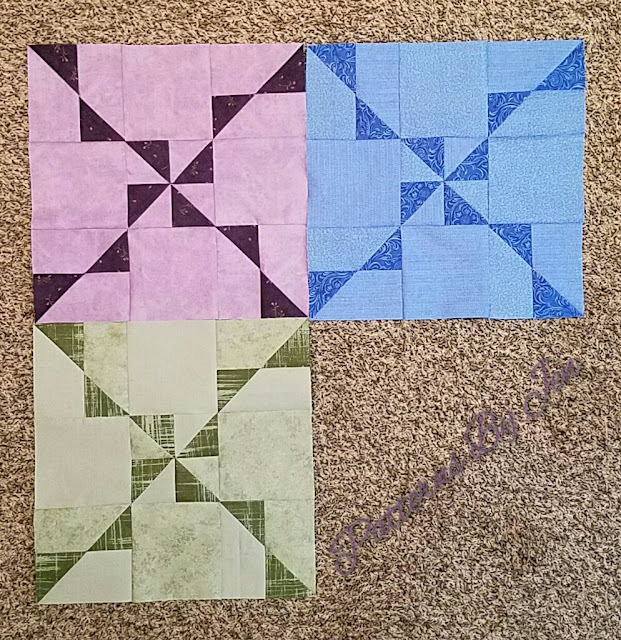 Color Value in a Quilt from The Seasoned Homemaker is a post that has a few tips on finding value and it's importance in a quilt pattern. Working on a value chart. 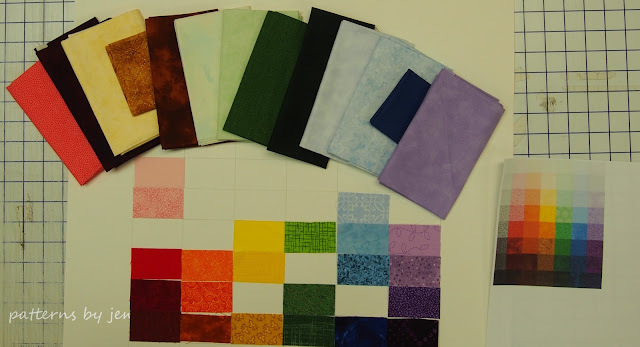 Color Theory for Quilting from Sew Mama Sew delves a little more into other color decision, such as saturation and compliments. 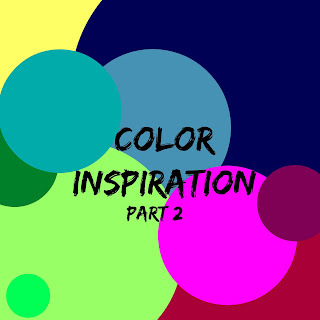 Color Play Friday from Laurel Poppy and Pine is a post that comes out every Friday and multiple bloggers participate. They all get the same photo and need to do a fabric pull. It's interesting to see how each pull is different and how they each got there. 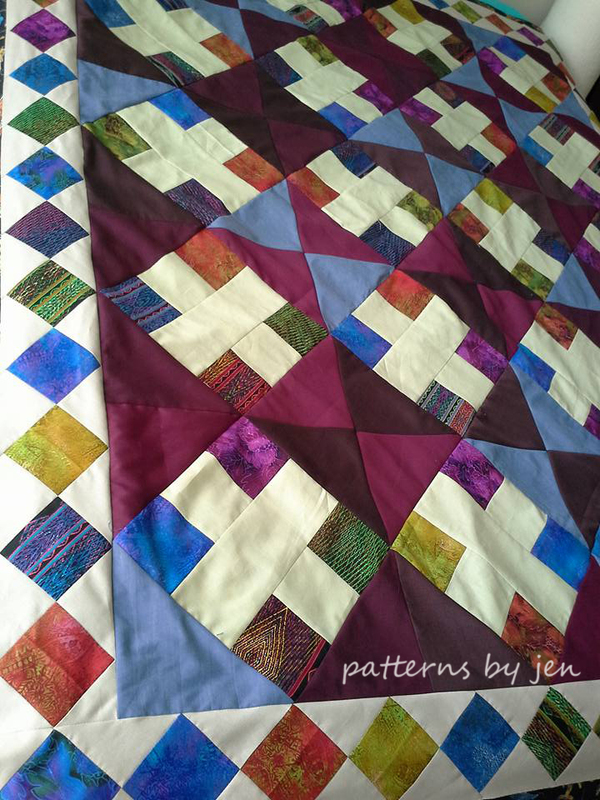 Choosing color for a quilt from Diary of a Quilter is another good article with a few extra links to follow. Sometimes I use paint chips to pull colors at the fabric shop. There are so many great posts and articles about color. If you have a favorite, please share in the comments. 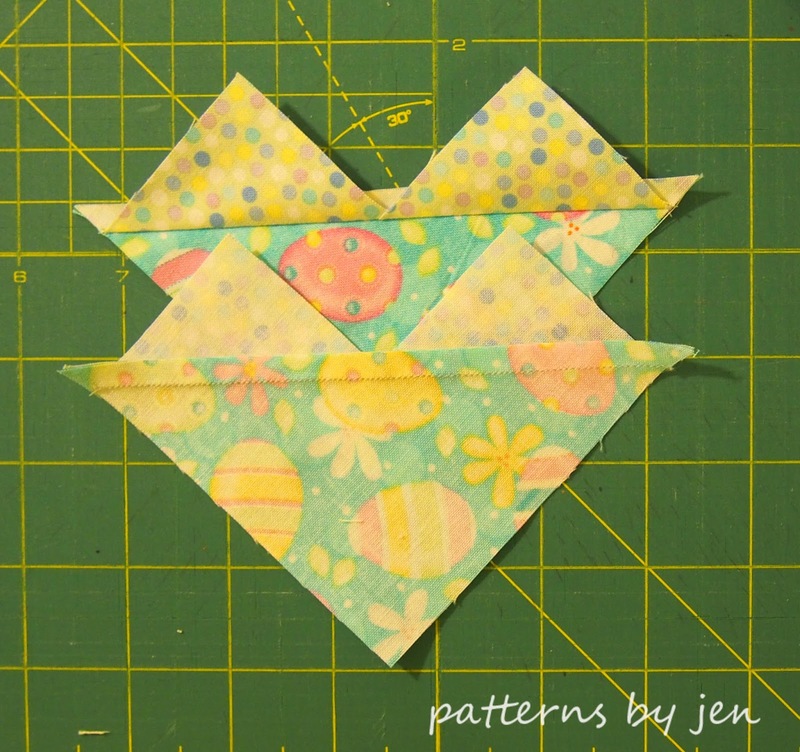 Stop two on our little Flashback Friday series is with Spinning Bow Ties. Baby number two for PBJ. Isn't she pretty? I showed the inspiration quilt the for colors, from a tester, in this Finding Your Color post. 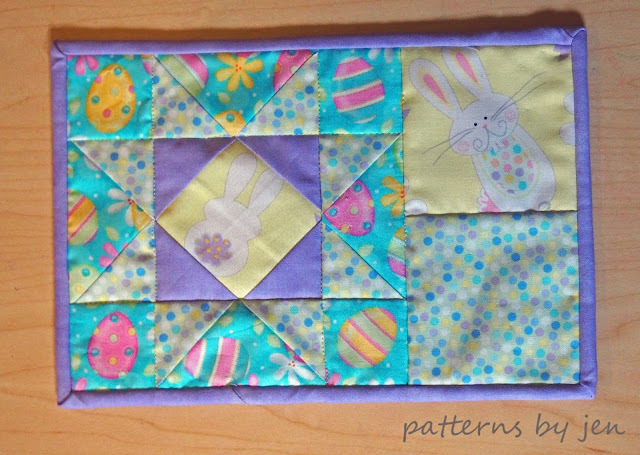 That polka dot border had to be used. I love polka dots. Love. Them. So of course I had to incorporate them. 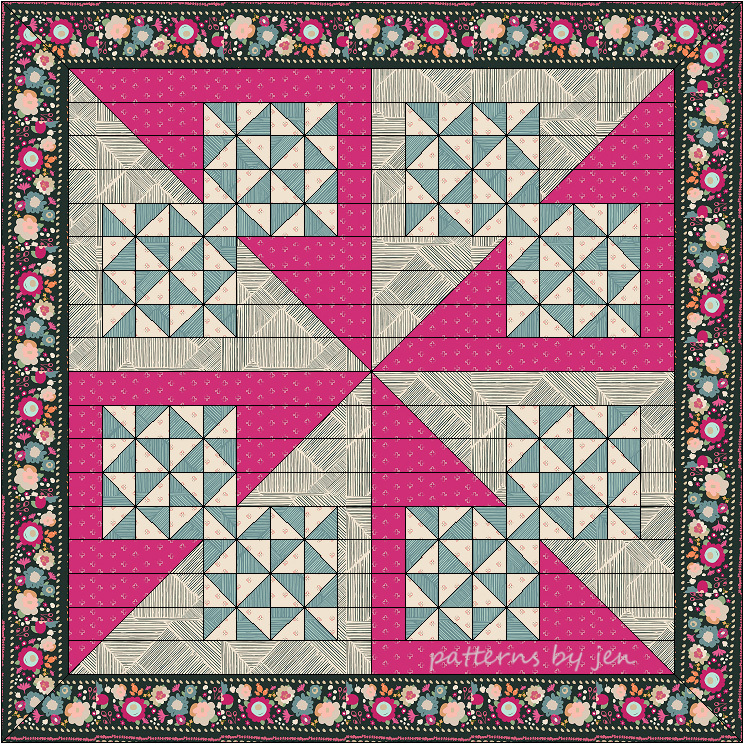 Just as I did with the first post on Pinwheel Pizzazz I am going to do a little updating with some new fabrics that are just being released or soon will be. 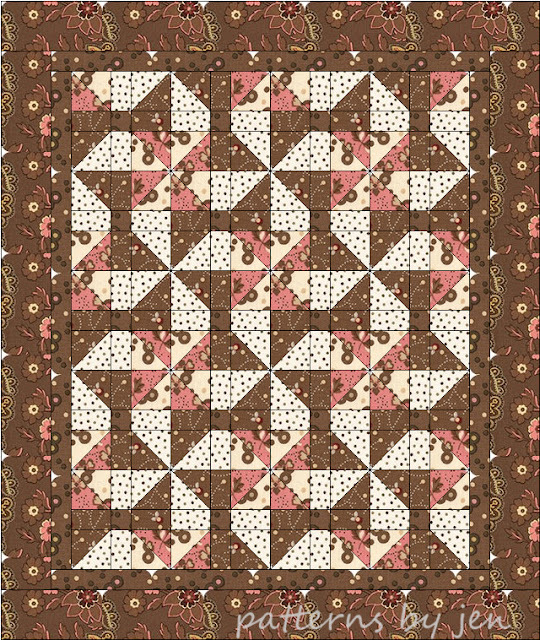 I love a quilt in brown and pink. This mock up using Robert Kaufman's Sweet Charlotte by Darlene Zimmerman has just enough pink to soften the brown. Sweet Charlotte was first available in January, 2017. New from Connecting Threads is this pretty fabric collection Country Inn. 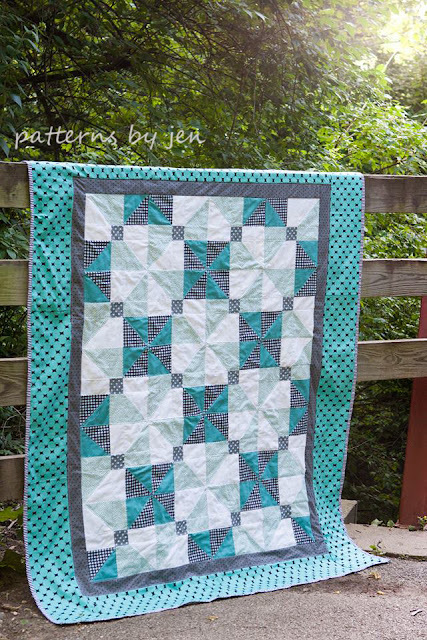 I love the look of this quilt with just two colors. Spinning Bow Ties is a really simple pattern, that has just been upgraded to include more sizes. 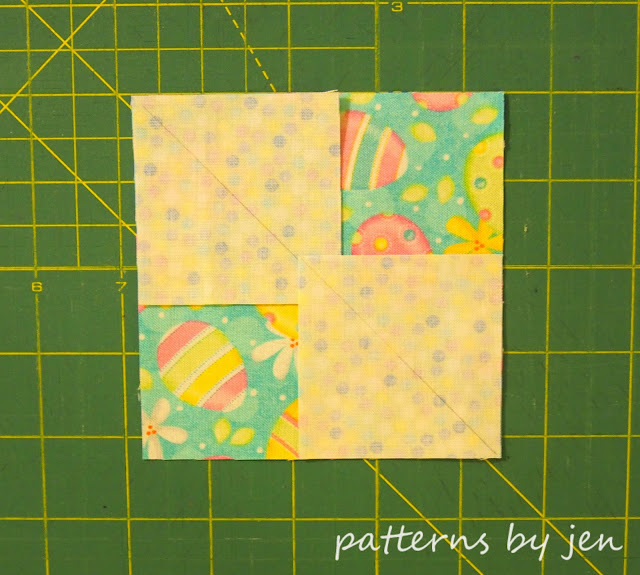 Instructions are included for getting that perfect half-square triangle that makes piecing the block extremely easy. Shhhhh, this is my favorite. 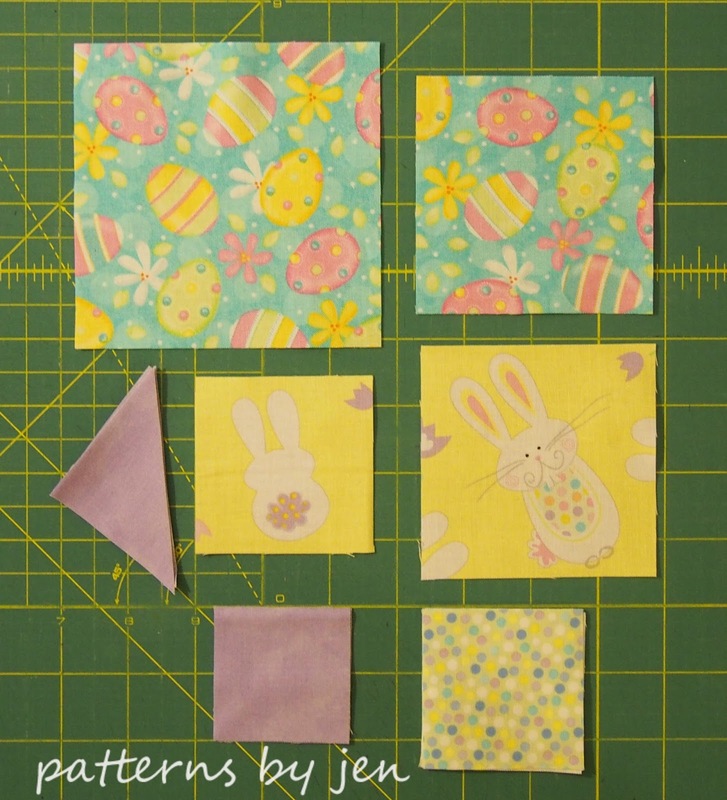 Fabrics are from Moda's Fragile by Zen Chic. The really, really sad news is that it isn't available until September. Sniff! I might have to remake this pattern in these fabrics when they are available. I love this that much. 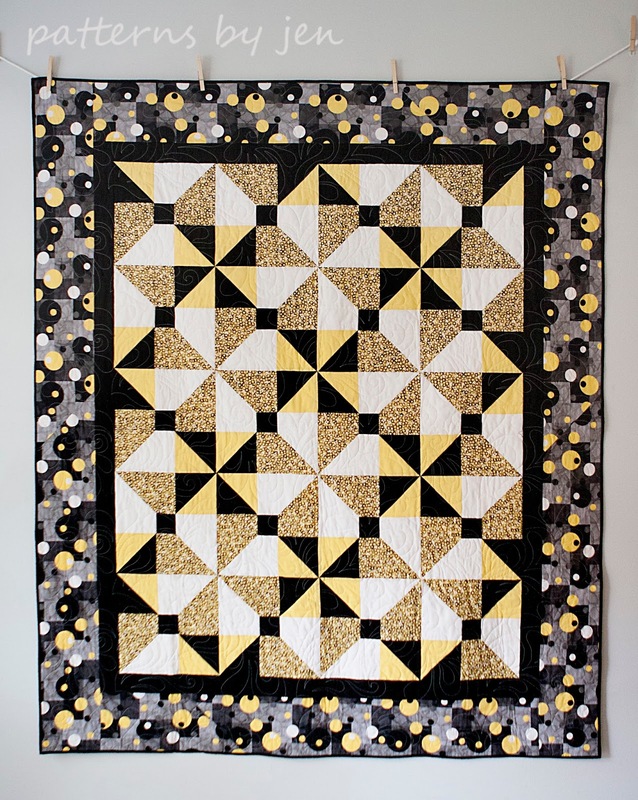 Spinning Bow Ties is truly a beginner's quilt. While an advance quilter can take this pattern and make it theirs, so can a beginner. Spinning Bow Ties is laid out for beginners to be able to follow and produce a beautiful quilt easily. 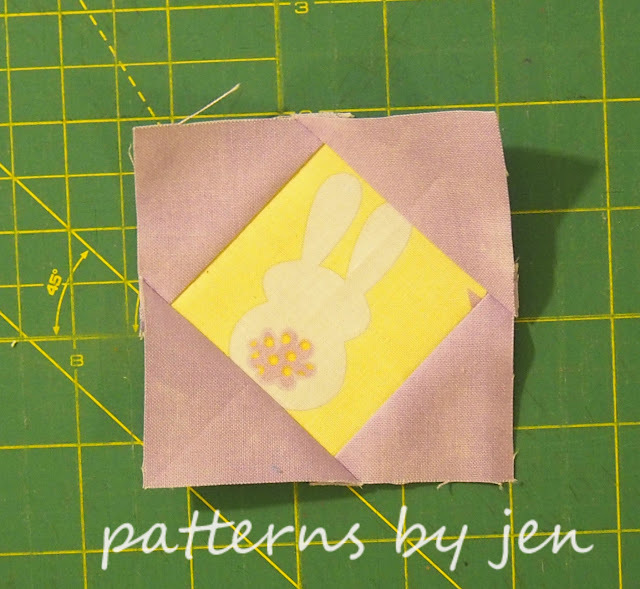 The digital pattern is here. 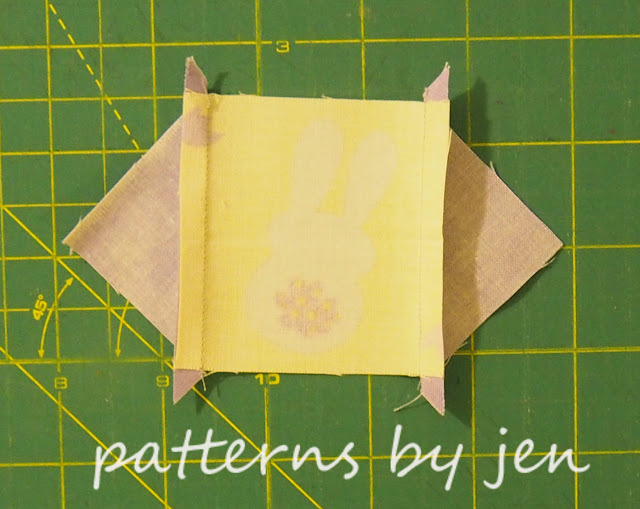 The paper pattern is here. 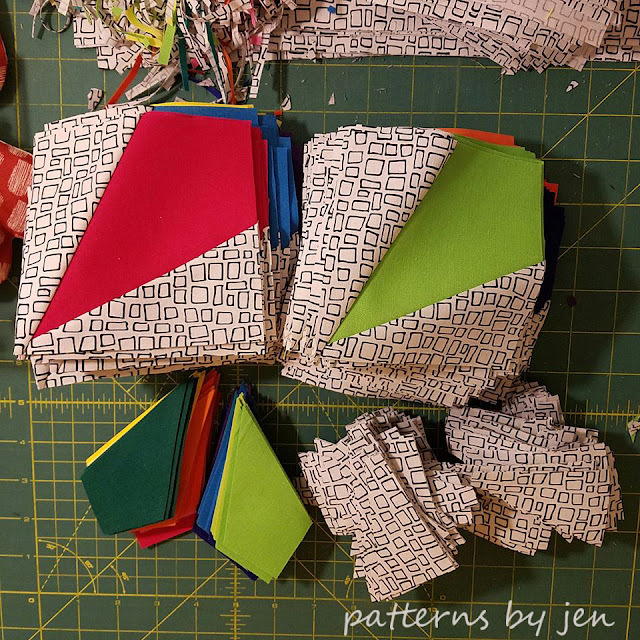 Connect with me on Instagram and share your progress and finished quilts by using #PattensByJen on social media. Do you ever struggle with picking colors? I do. Every. Time. So where do you go for inspiration? How do you decide on colors to pull? I have a few different resources that I would like to share. Let's explore these a bit. Yes, yes, Pinterest. If I'm feeling like I'm not absolutely loving the colors I've put into a mock up, or if I'm struggling to even come up with a color plan, this is where I start. I highly recommend that you start a board just for color inspiration. You can find mine here. 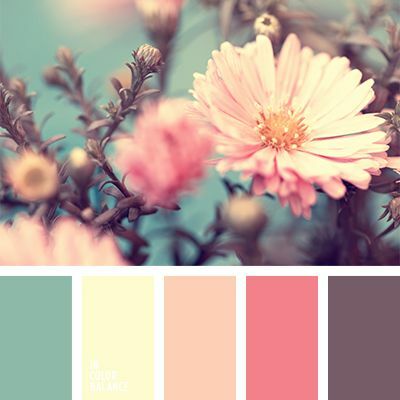 Sometimes I just simply put in: "color inspiration" and I get so many ideas. Hello gorgeous! (Although I'm not sure about those towels...) I cut off the top, because you don't need to know how many windows I currently have open. It's scary. Trust me. Start scrolling down that screen and you can't help but be inspired. Feeling spring like? Search "spring colors." Beautiful. When I clicked this one I was brought to the Color Palettes #1253 page. Whoa whoa, whoa. There's a Color Palettes page?? Yes, yes there is, and I just found my new best friend. I just bookmarked their main page. I love when I find something new when I'm researching for you! Nice! Sometimes, I have no idea what I want color wise. (This may be true when asked where I want to eat as well, but that is a whole 'nother post.) If I need to bounce ideas off of someone, I go to my trusty girls at the LQS. They never fail me. We don't always have the same plan, but we've worked together enough now that with a little time, searching and conversing, we come together for some great color schemes. I also trust them to tell me if I'm way off. Softly Circled is going to be released April 24th. 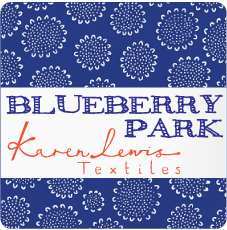 When I went looking for colors for the larger sample I had this pallet in mind: Blueberry Park by Karen Lewis for Robert Kaufman. 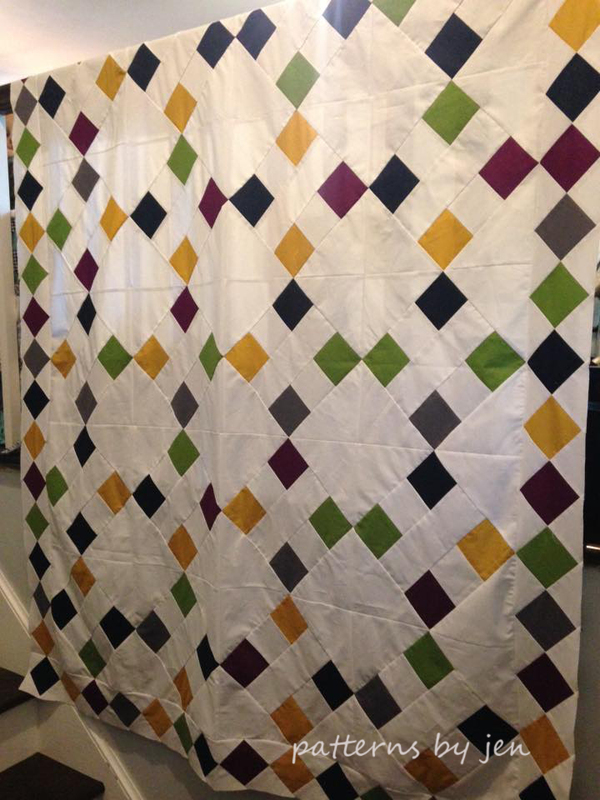 My idea was to use the low volume fabrics as the background and the brights for the main pattern. I was worried though, because I couldn't see them in person. 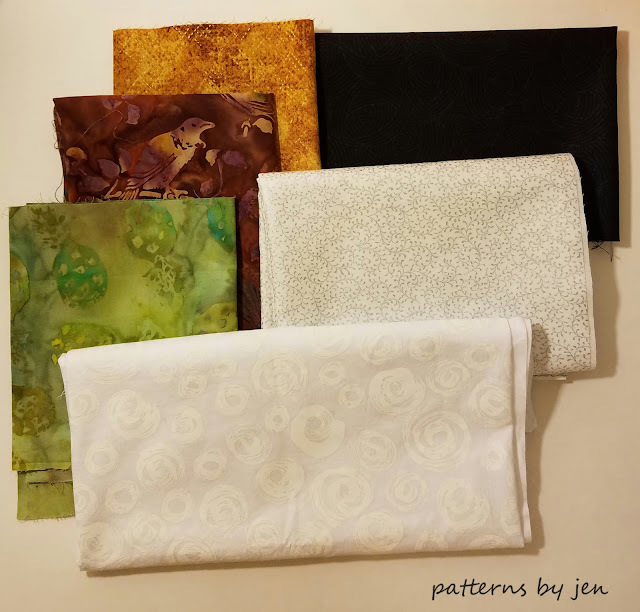 So off I went to Fabrics Plus, my favorite LQS. Where Cami took my hemming and hawing, and "I'm thinking...., but maybe that's too much and I need....but then I would really like....." and found exactly what I wanted, even though I didn't even know what it was myself. I highly recommend building a relationship with those at your LQS. Sometimes I draw up a pattern, and when I'm playing around and just adding colors I get one that just hits perfectly. It doesn't happen often, and I tend to question most of my choices, but sometimes it speaks to me. If that's the case I run with it. 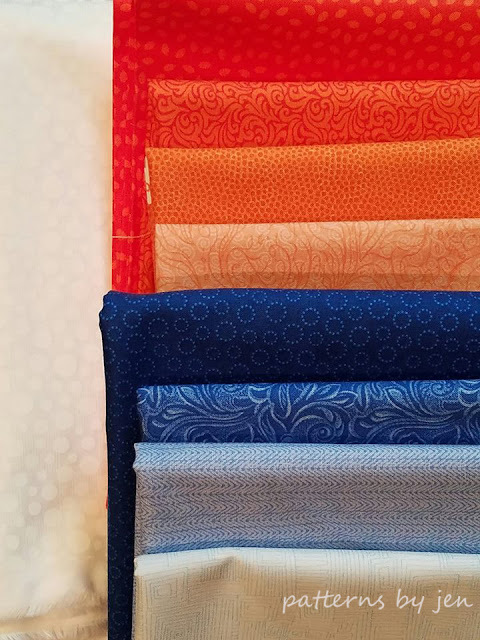 I hit up my LQS, and say I want...show them picture and we start pulling fabrics. This happened for the next pattern coming out in May, Gradient Stars. Both samples were just made to be in the colors they were made in. You can feel it. They are happy being them. 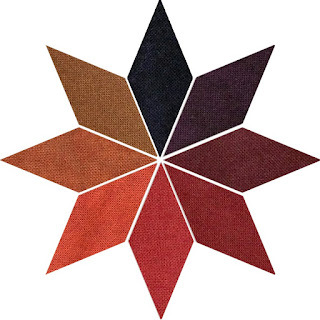 These are the colors I drew it up in, and I think you will love it. 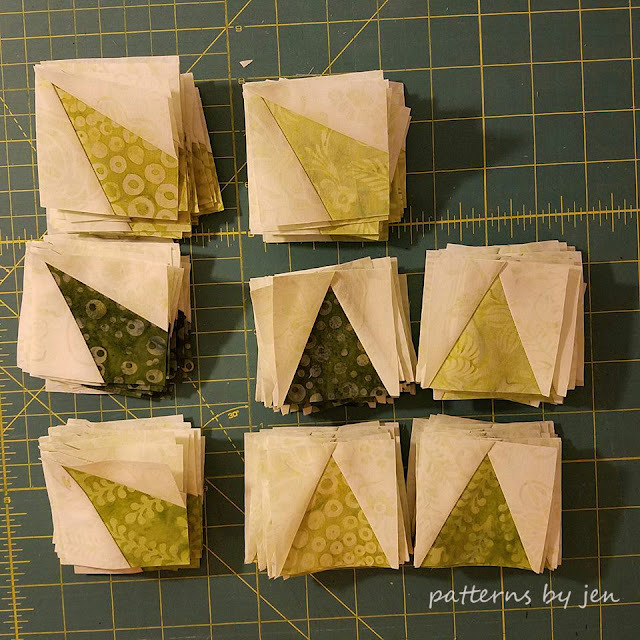 I don't know if it was because I was picking these colors out in Jan, but I was full on green mode when I chose the colors for the second sample for this pattern. It too is a beauty, in my humble opinion. Sometimes, though, you need to pay attention to those who are also making your patterns. Many times I have seen a color combo come together and been inspired. 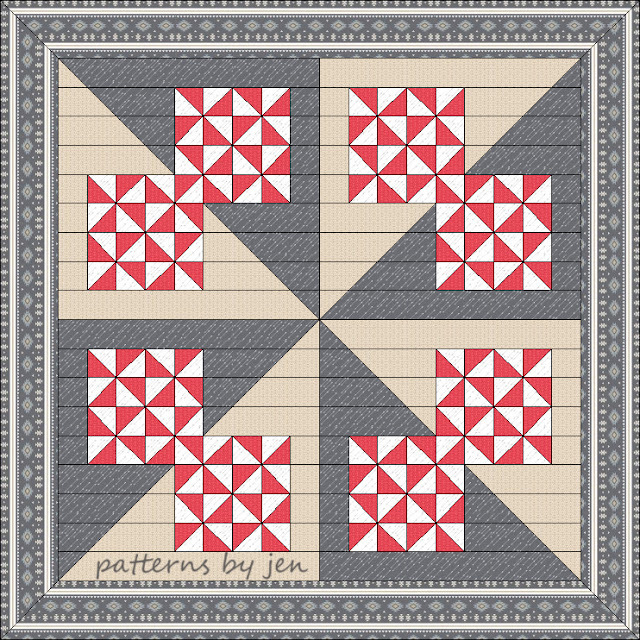 The small sampler for X-Squared was inspired by Kelly, of Handmade Boy, and her test quilt. As well as DeDee's. Their jewel tones really drew me. 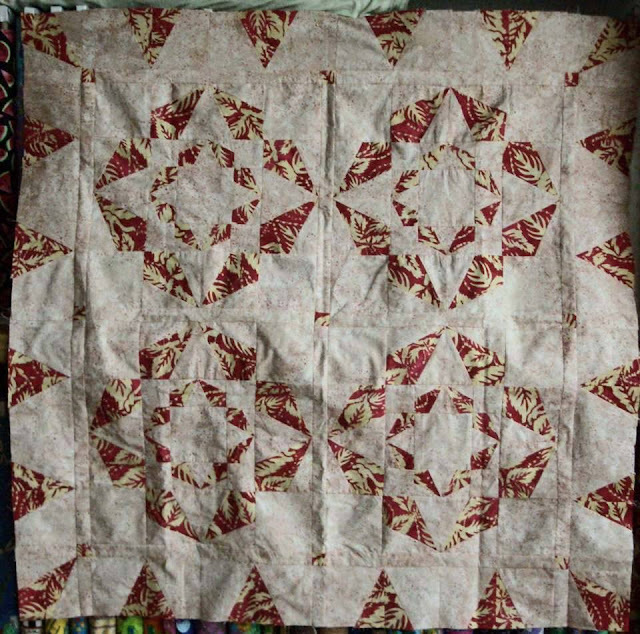 Spinning Bow Ties was my second quilt pattern. Kelly's version inspired me. I loved her color pallet. There are classes you can take on color and value. I think these are great classes to take. I did an evaluation on Understanding Value in Quilt Design from Craft University, taught by Grace Errea of Amazing Quilts By Grace. You can read that blog post here. That class really helped me find the right combination for Gradient Stars. 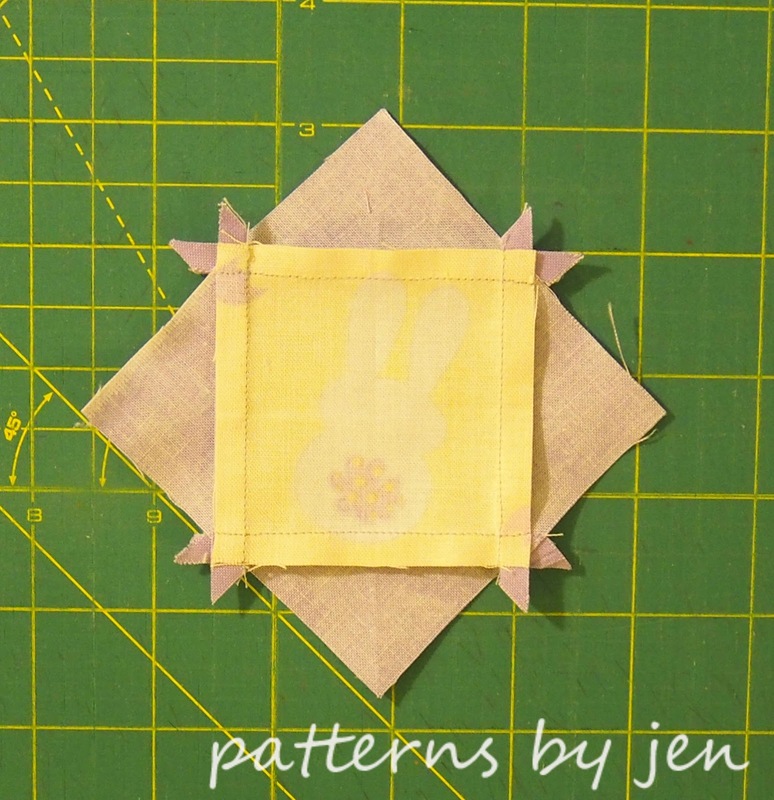 Ooo, this post is just full of sneak peeks!! Where do you find your color inspiration? I would love to know! I'm going to run a short Flashback Friday series introducing my patterns, starting at the beginning. 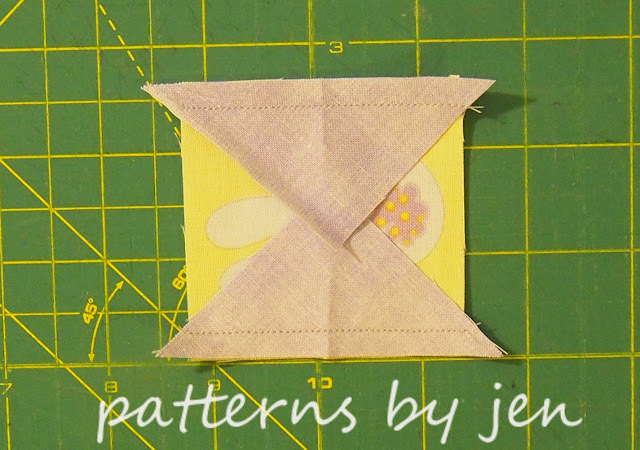 There are nine patterns (soon to be more), hence the "short" series. 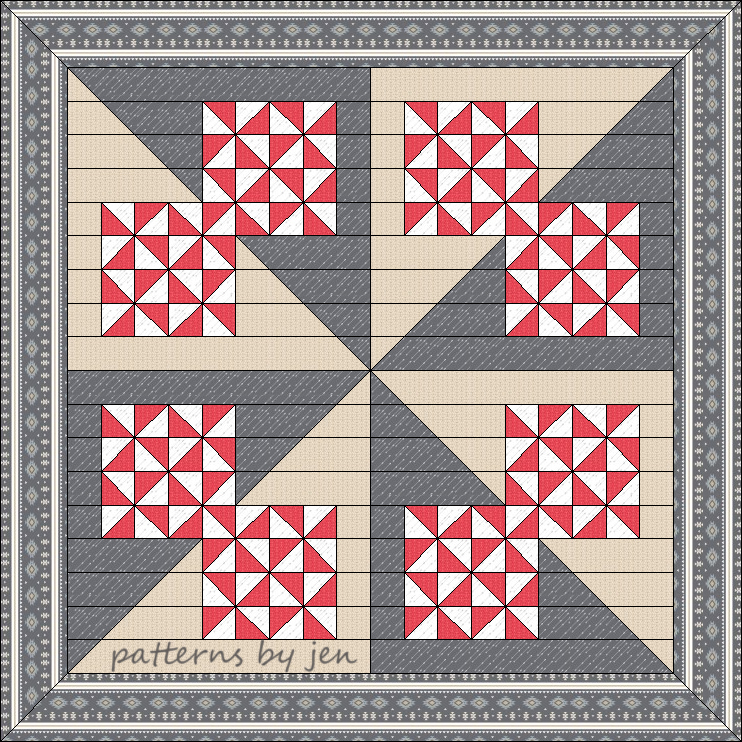 We will start with Pinwheel Pizzazz PBJ-101. Here she is in the colors I drew and imagined her in. I still adore her, even though I know she looks a tish outdated. I have to admit, though, that the smaller version I made for the back almost became my favorite. I love the soft colors. 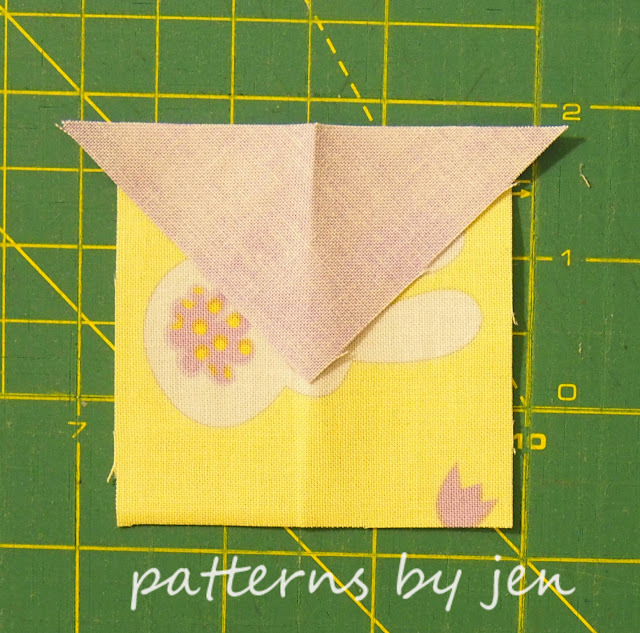 Had I been a more confident quilter/designer, this would have been a great border to miter. I'm a little sad I didn't. However now I am adding a change to the pattern so that you can make a mitered border if you would like. Yay for growth! To help show how awesome this could be, I made up a few mock ups in fabrics that are just being released. This first one is still definitely me, as I seem to choose softer, "steadier" colors. These fabrics are from the Helvetic Collection from Camelot Fabrics. These will be available in August, 2017. This mock up is another soft aqua. 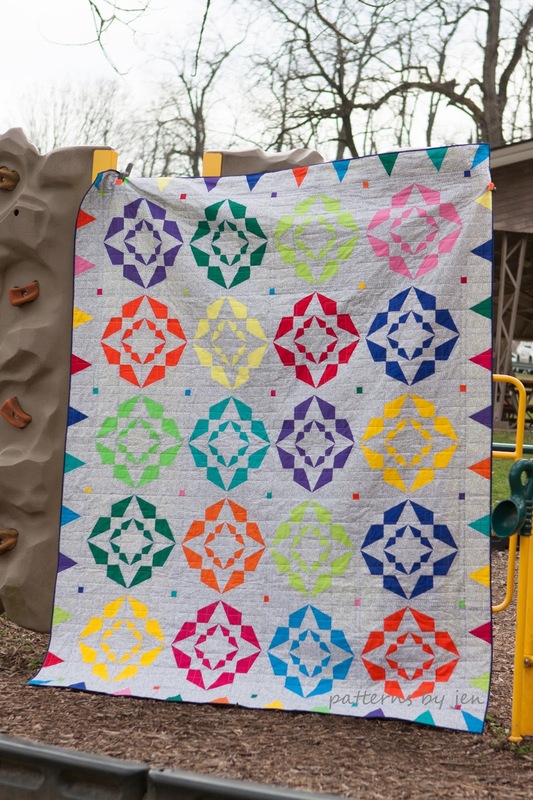 Perfect for a new little one. The fabrics are pulled from here on Hawthorn Threads. This border! 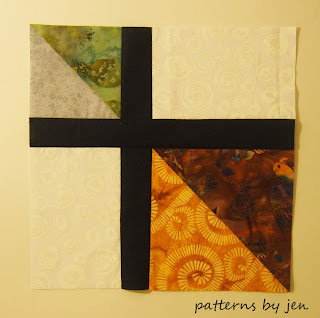 This fabric was made to be a mitered border. I just love the flowers. 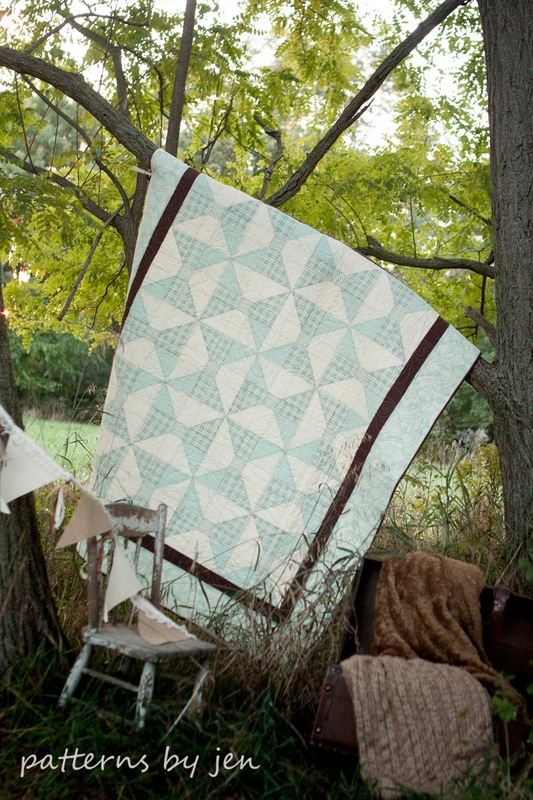 This fabric line is Indie Boheme from Art Gallery and should be available very soon. I hope you enjoyed this first Flashback Friday. 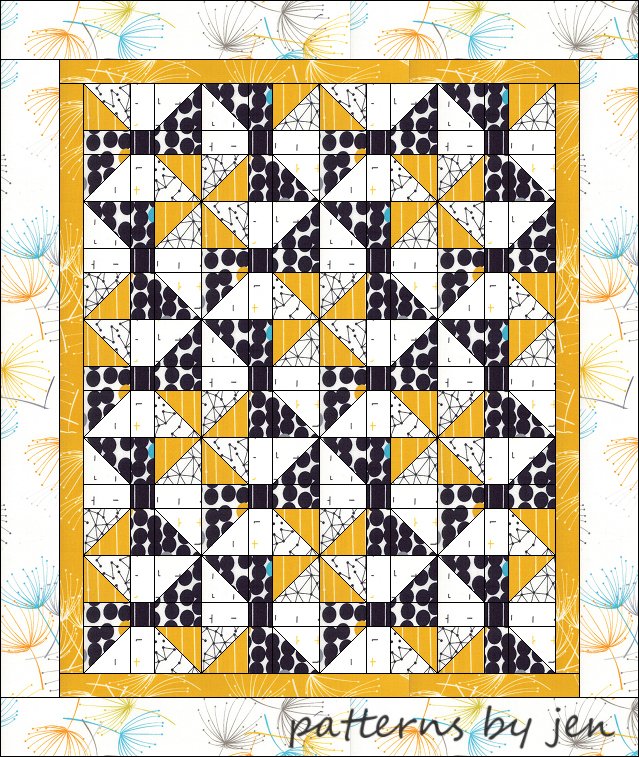 The pattern sale ends today (April 8), but head over to get your paper or digital patterns for $5. 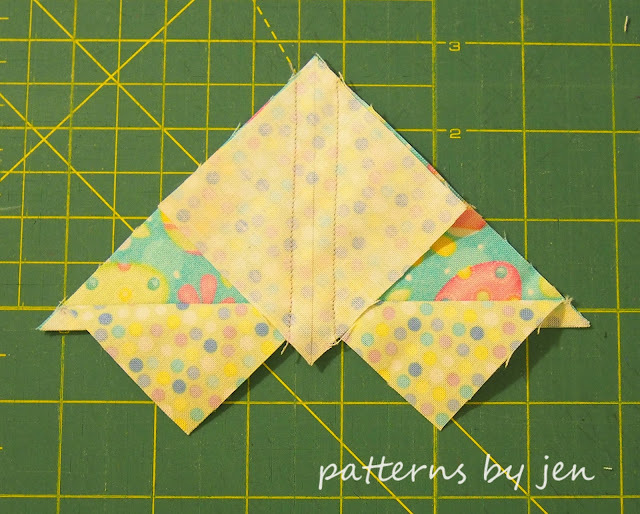 Don't forget to check out the free Muggamo patterns! Quick mug rugs available the 1st of the month all year long. 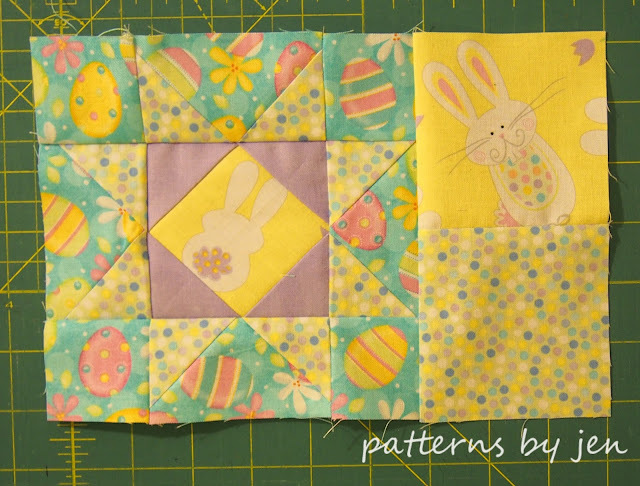 Welcome to April's Muggamo tutorial! 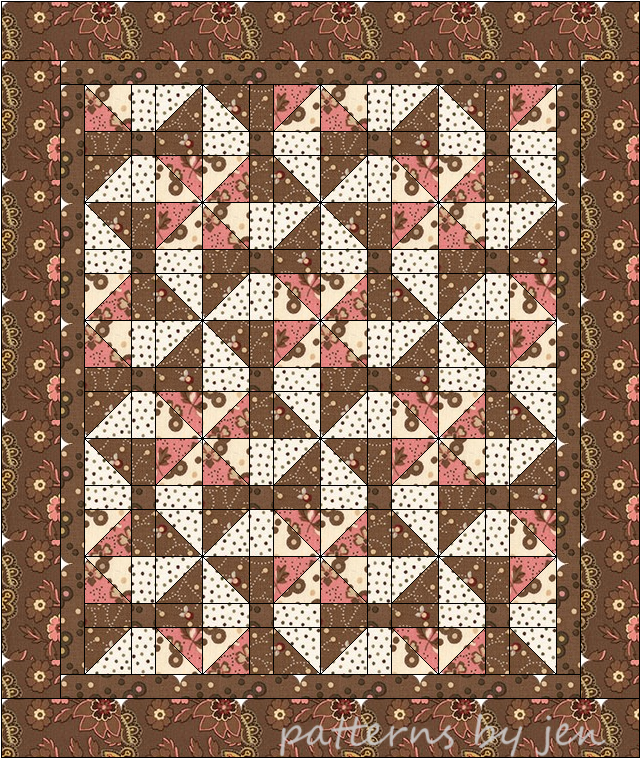 The great thing about Mug Rugs is that they are great scrap busters. You don't need much to make a cute, functional piece. Draw a line on the diagonal on the wrong side of each square. First we will make the middle Square-in-a-square block. 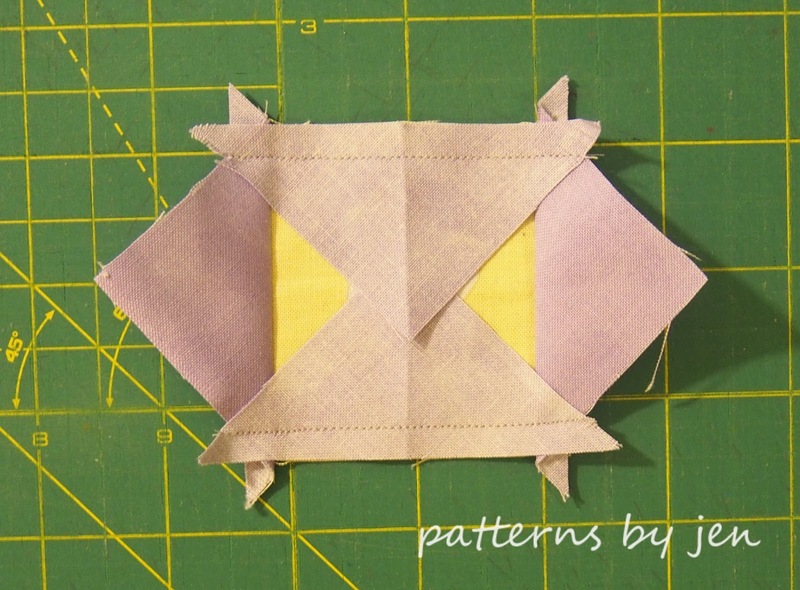 Find the center of the square by folding it in half and finger press. Do the same to the long side of the triangles. 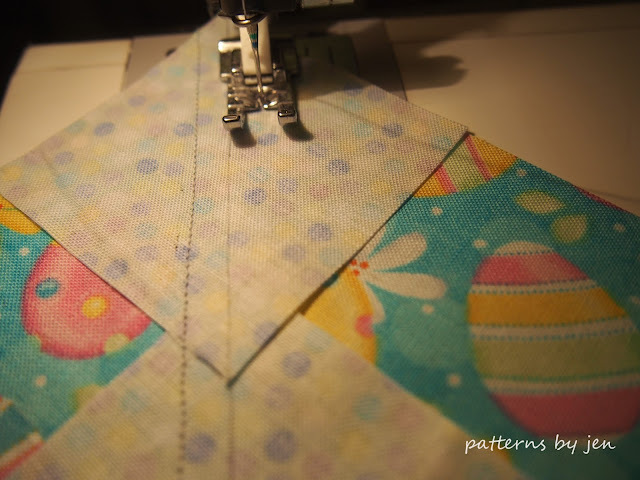 Match up the folds and stitch. Using the 2 5/8" square and the triangles, sew two triangles to opposite sides on the square. Repeat with last two triangles. I like to trim off the dog ears. Next we will make the No Waste Flying Geese. Using your 4 1/4" Fabric 3 square and 2 3/8" Fabric 4 squares we are going to make four Flying Geese Units. Line up up two small squares right sides together as shown. 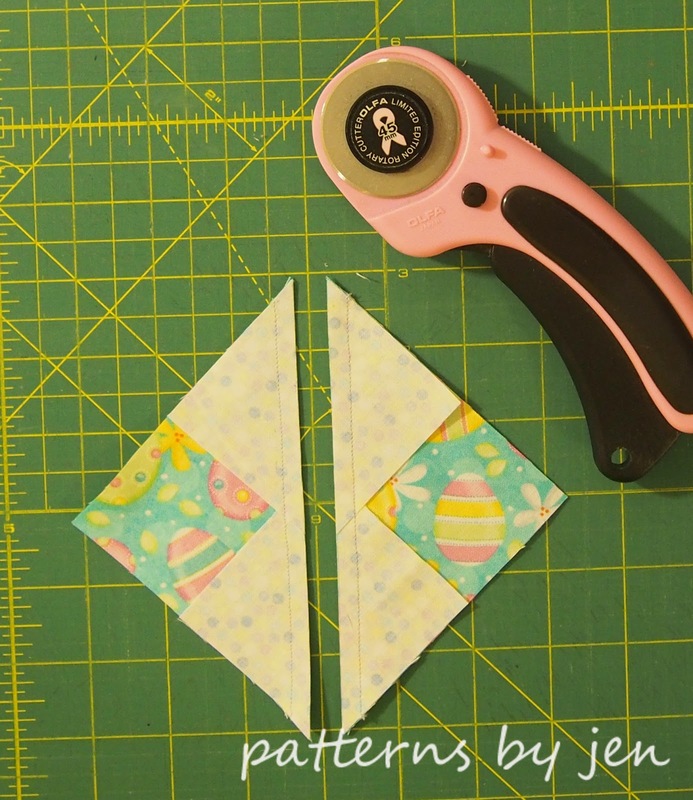 Sew a scant 1/4" on either side of the drawn lines. 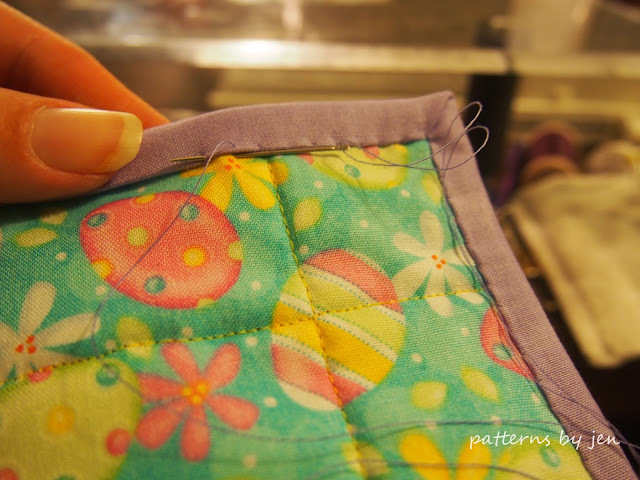 To sew a scant 1/4" when following a line, I like to put the edge of the presser foot just slightly over the line. 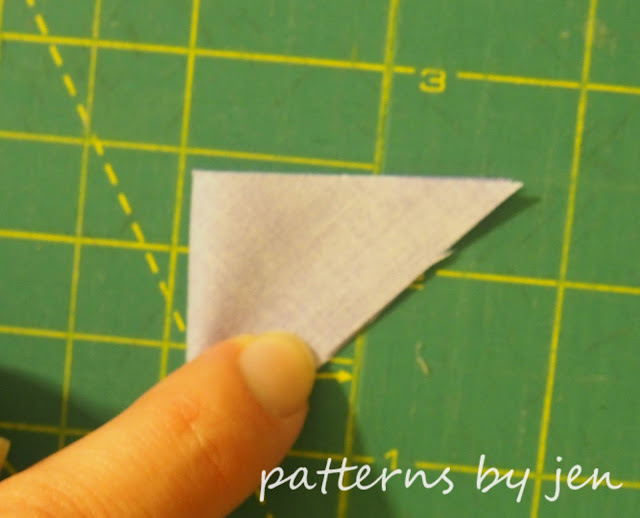 Cut on on the drawn line and press towards triangles. 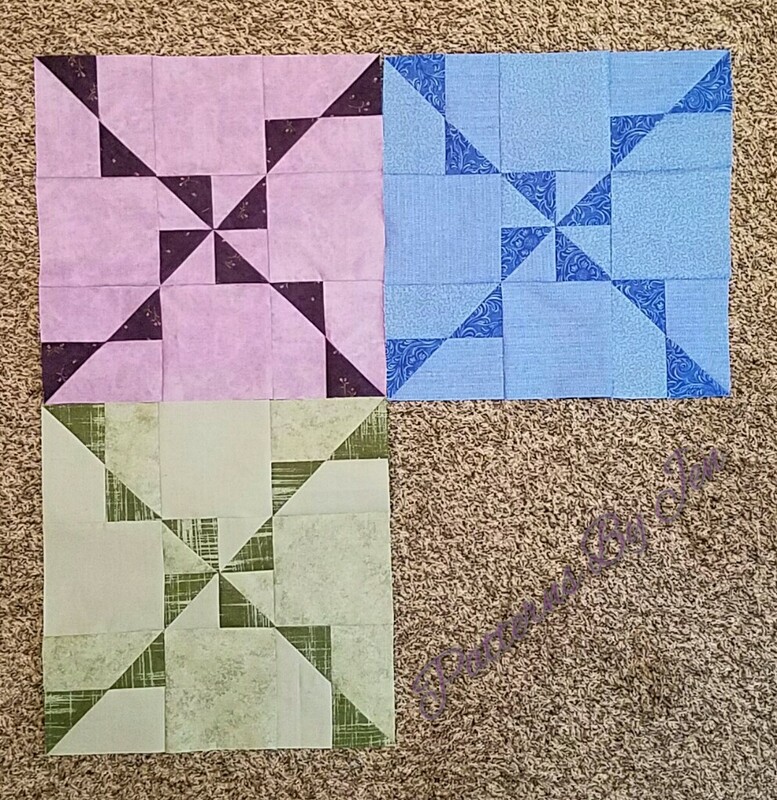 Place 1 square on each of the units just made, right sides together. 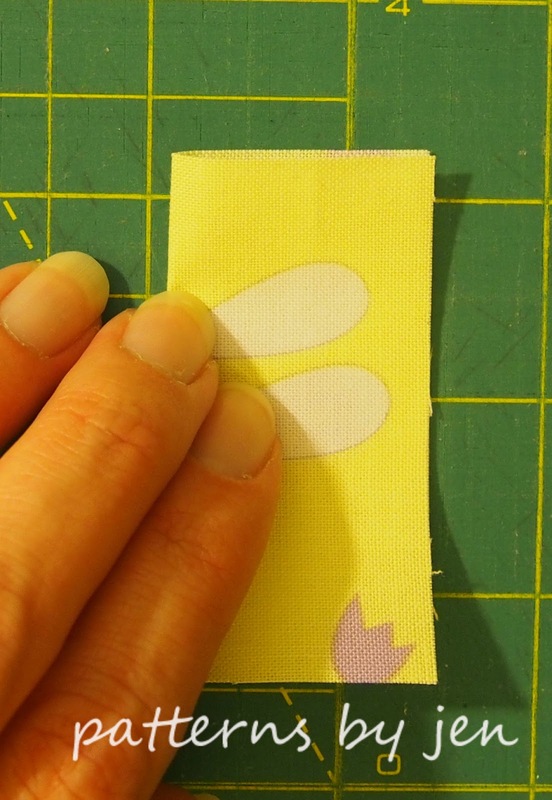 Stitch a scant 1/4" on either side of the drawn lines. Cut apart on the drawn line. Press towards triangle. 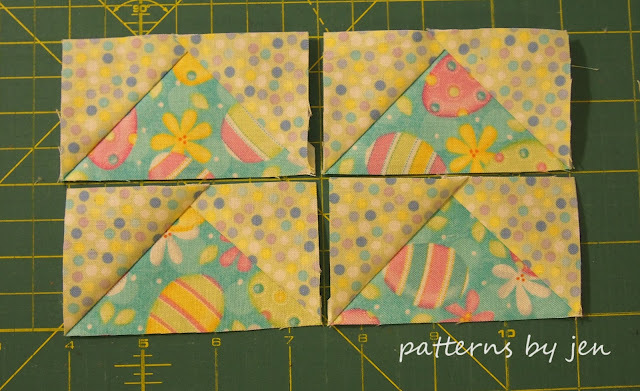 Units should measure 2" x 3 1/2"
This method gives you four Flying Geese units. 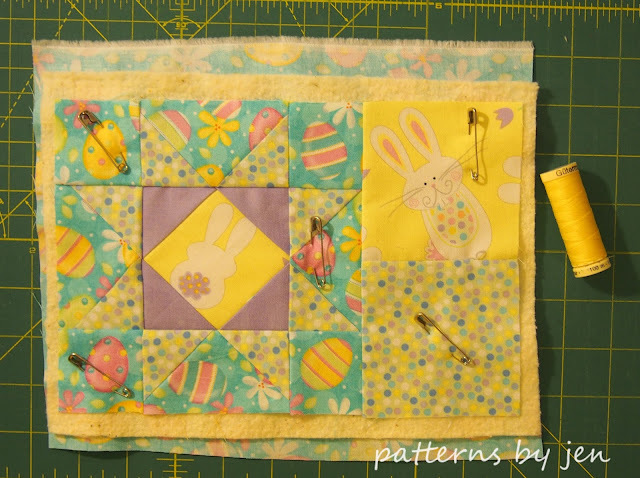 Next sew the side piece using your leftover 3 1/2" squares. Press to either side, your choice. 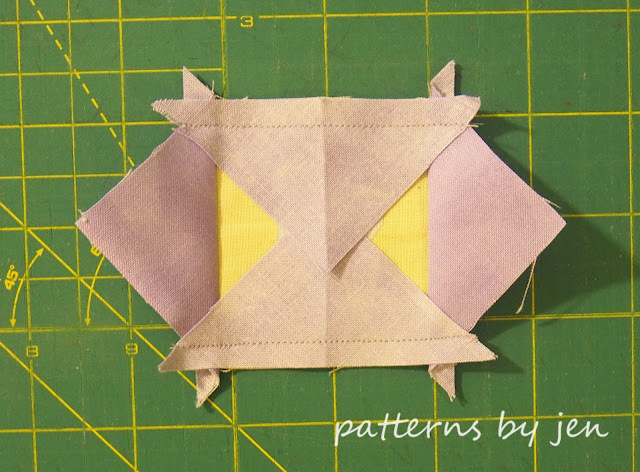 Add the side piece to the block, press towards side piece. Layer it up. Even with a small piece I like to secure it with pins. Quilt it. I've used a walking foot and just stitched in the ditch for all of the mug rugs so far. Bind it. 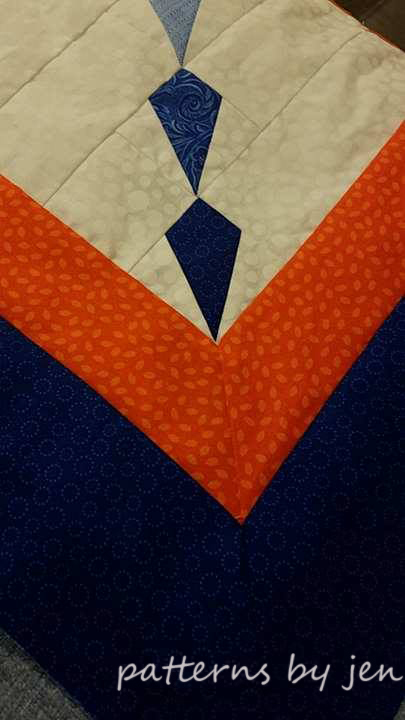 *sigh* Even the small pieces get hand stitched binding. I cannot do a nice machine binding. 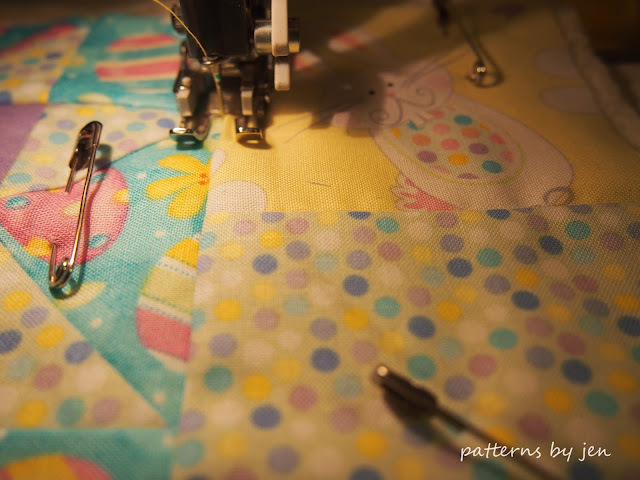 Thank goodness I adore hand stitching! 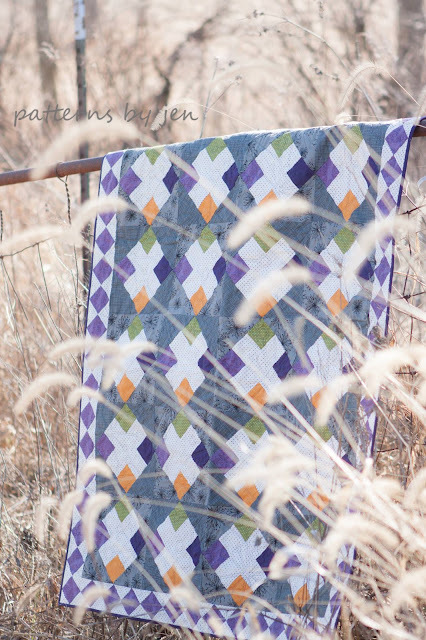 Don't miss the pattern sale, going on now until April 7th. All patterns are just $5.00! If you make an April Muggamo mug rug, please share with #muggamo and feel free to link up.